In our world today, we constantly get bombarded with images and commercials advertising delicious, tempting, unhealthy foods. Our society seems more focused on making ends meet, even at the cost of having an overweight, nutrient-deficient, lethargic population. Many of us work long hours, and don’t feel like making healthy foods when we get home. We want something quick, easy, and readily available to us, which usually means TV dinners and fast food. Staying on track with a diet can seem utterly impossible when you walk into a store filled with more toxic, chemical-laden, nutrient-poor foods than healthy, nutritious, nurturing foods. However, even though having some things in moderation won’t really damage your health, consuming them on a regular basis can cause serious, even fatal, diseases. To have optimal health, you should avoid the following foods at all costs, or at least eat them very sparingly. In a study performed earlier this year, University of Michigan researchers reported that mercury levels in yellowfin tuna had increased almost 4 percent annually from 1998 to 2008. Regular exposure to mercury can cause serious, sometimes irreversible, brain and nervous system damage. Our oceans have become contaminated with a dangerous cocktail of environmental pollutants, which the marine life inevitably absorb. When we consume seafood nowadays, most of it will contain several toxic heavy metals which our bodies simply don’t digest or absorb properly. An analysis by health experts at the magazine Consumer Reports found that a 140 pound woman would exceed safe mercury exposure by consuming just 4.5 ounces of tuna per week. A 48 pound child who eats more than one-third a can of tuna per week, or the equivalent of the amount on a single tuna sandwich, could suffer permanent brain damage from mercury exposure. If you do choose to eat tuna, go for canned light tuna rather than albacore, as this kind contains less mercury. Better yet, you could cut out seafood entirely, or go for shrimp, scallops, sardines, or wild and Alaskan salmon, which all have low levels of mercury. If you see hydrogenated oils on a label, please do yourself a favor and put the product back on the shelf. Hydrogenated oils have no place in the human body, and some studies have even found that the oils leave scars on the internal walls of the arteries due to nickel often used in the hydrogenation process. That’s right; partially hydrogenated oils contain a catalyst of some sort in order to heat the oil up faster, and nickel, platinum, or even aluminum are used in the process. Heavy metals such as these have been linked to Alzheimer’s and other mental problems, so anything with partially hydrogenated oils should be avoided at all costs. Hydrogenated oil is only one molecule away from plastic, so think about the adverse effects you could experience from consuming this toxic man-made concoction. Of course. naturally occurring sugar from fruits and starches is perfectly fine to consume, but when it is extracted and added back into processed foods, then it becomes a problem. Refined sugar, for one, doesn’t contain any nutritional benefits, so it’s just empty calories at the end of the day. In various studies, refined sugar has also been linked to an increase in anxiety, depression, and addiction, and a decrease in learning and memory. Naturally occurring fructose found in fruit will not harm your health; it only becomes an issue when you eat fructose out of its natural state, such as in boxed or canned foods. Consuming too much processed fructose can lead to insulin resistance, obesity, diabetes, a fatty liver, high blood pressure, and much, much more. Not to mention, fructose can cause neural activity to stagnate for up to 20 minutes, according to a 2011 study on the impact of glucose and fructose on the brain. Most people know that a diet high in saturated fat can clog the arteries and contribute to heart disease and strokes, but did you know that a diet heavy in saturated fat can impair cognitive function as well? A study published in the journal Neuropsychopharmacology found that consuming large amounts of saturated fat can lead to reduced cognitive function and also a dulling of the dopamine reward system, increasing dependency and addiction to unhealthy foods. 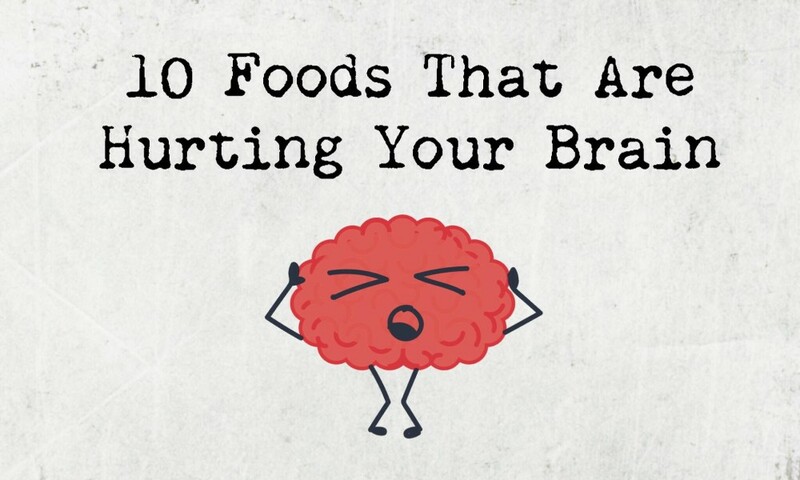 Processed foods usually have a laundry list of chemicals, some of which have been linked to mental and behavioral disorders. Aside from the dangers of the ingredients, a study published in the Journal of Clinical Investigation in 2012 found that consuming a diet high in fatty processed foods can even lead to damage in the hypothalamus, a part of the brain that regulates hunger and thirst levels. More and more studies have been published about the detrimental effects of fast food on the body, and it shouldn’t come as a surprise why fast foods can cause so much damage. These “foods” have been stripped of almost all nutrients, and altered drastically from their natural state. A better way to describe them would be “food like substances,” because these culinary inventions really don’t resemble food at all. Fast foods lack many vitamins and minerals, including iron; iron deficiency might lead to poorer scores on tests in students who regularly consume fast food. Another highly processed food, this one causes even more damage due to the way in which one must prepare it. Not only does the popcorn contain toxic chemicals and additives, but popping it in a microwave strips the food of any nutrients that might be left, increases white blood cell levels, and creates carcinogens. Not to mention, the radioactive emissions generated from the microwave can lead to a slew of mental health problems. Another form of refined, processed food, cookies and chips have pretty much zero nutritional benefits, but add on unnecessary calories. If you want a snack, go for some fresh fruit or vegetables to avoid all the chemicals and extra sugar in these highly addictive foods. According to a study published in the Journal of the American Medical Association, consuming drinks or foods with high fructose corn syrup disrupts the part of the brain that tells us when we’re full, which leads to eating or drinking unneeded calories. Also, consuming free fructose (not in fruit) has been proven to be just as addictive as drugs, which means food marketers all over the place know this, and use this to take advantage of us. To achieve optimal mental health, try to avoid these foods or severely limit them in your diet.